VITERBO - The exhibition of Australian art at The Kangaroos Visit organized by Peta L Lowry of the Australian Cultural Centre and being hosted by Parco dei Cimini opens a new view of nature, which springs from the passion that you can read in the works on display. Ideally you can create a union between the southern hemisphere with the northern hemisphere, changing the size of the trees, the colours of the birds, the sea life and the depth of the sea, but this does not change the respect that man must have for nature, for its balance and that should not be stopped unless we want to find ourselves in an inhospitable place. Thanks to the traditions of the Aboriginal and Torres Strait Islander people, this is a concept known and respected in Australia, with the artists ready to learn and perhaps paint their pictures or take their photographs in this part of the world, Tuscia, fortunately unspoiled and full of history. 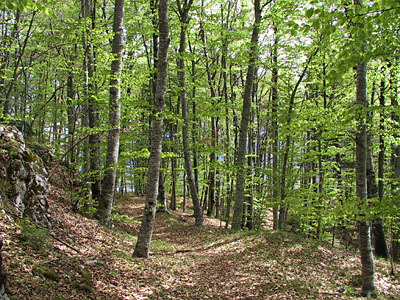 Forests like the Faggeta (Beech) in Soriano nel Cimino, volcanic lakes like Lago di Vico and Bolsena, coasts where Etruscans lived, their graves, the many years of medieval history that has grayed many villages and the Renaissance that has handed down to us works of art full of beauty and meaning, like Villa Lante and Sacro Bosco (Sacred Forest). And still there’s more, like the villages set like diamonds in the rock, just think of Civita di Bagnoregio or the narrow streets of Pianiano, all over Viterbo the smells of history and nature are still very much intact, and only the watchful eye of Steve McLaren, Australian Artist, who promptly photographed what he was able to, could meet in his way, and in the same way, Senator Francesco Giacobbe in attending the opening of the exhibition, shows that it is possible to create a special union between Australia and Tuscia, linking them forever in the name of nature.